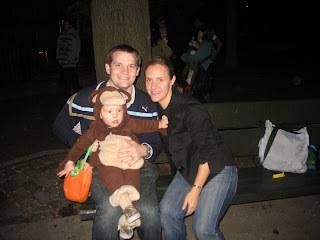 Another Halloween celebrated in the big city. 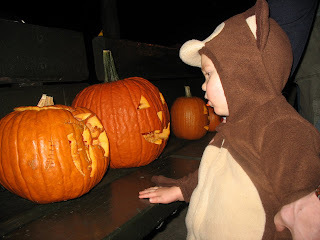 I used to feel bad for the kids in our neighborhood every Halloween because I felt like they were getting cheated of a "real" Halloween experience (i.e. 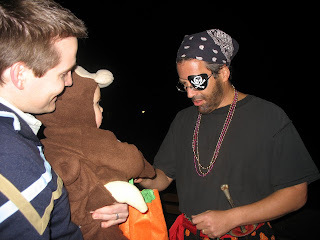 my suburban door-to-door trick-or-treating experience). 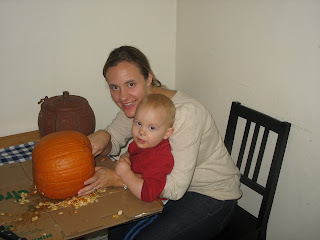 But this year when I felt like I had to create a fun Halloween experience for Noah, I realized that it's all about what you make of it. 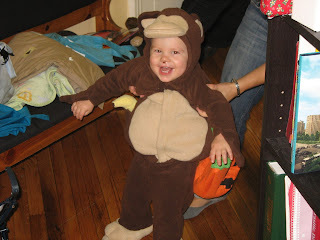 Noah looked cuter than ever in his monkey costume (he really doesn't even need to dress up... 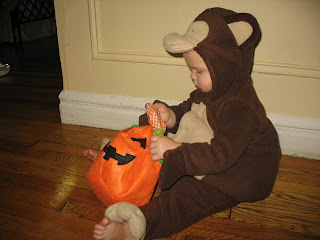 I swear this kid is part monkey!). 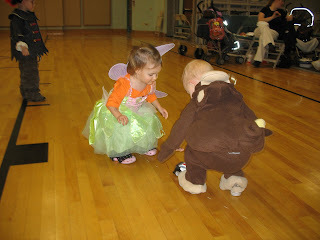 We had a blast at our ward and playgroup parties, trick-or-treating, and marching in our first kid-friendly Halloween parade! helping mom make halloween cupcakes! hey! where'd all my candy go? So, we only got one trick-or-treater the whole night. Not surprising though... the kids in our 'hood usually just go to the vendors along Broadway to get candy. But the one character we did get made up for all the rest. He spoke in 3rd person as L.L. 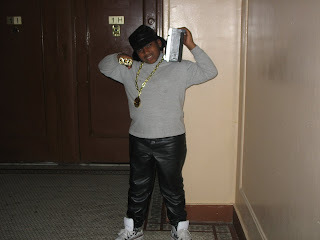 Cool J. and when I asked him if he'd pose for a picture, this is what I got... rockin', huh! I gave him extra candy for letting me snap a shot of him and he replied, "aces." 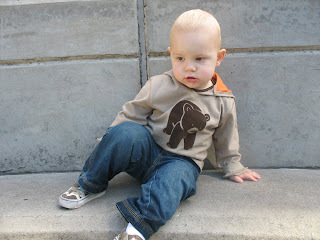 Noah is 17 months old today! favorite show: Go Diego Go! Today, Noah had his best Sunday ever! I really couldn't believe it. Two weeks ago he had his worst Sunday ever, so perhaps he's trying to make up for it. He sat through all of sacrament meeting (minus a diaper changing break), took a nap through Sunday school, and then sat with me during all but 5 minutes of RS. I was seriously shocked. He's getting really good at pretend play these days and is absolutely obsessed with any toy that has wheels. He can sit and push them around for what seems like forever and make all kinds of great noises to go along with them (vroom, vroom! 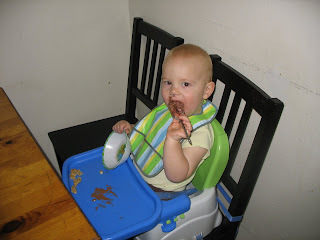 and nee-naw, nee-naw, nee-naw are two of his favorites). So, I packed his little back pack full of his trucks, buses, and cars -- and also saved a brand new dump truck to give him at church -- and he was completely entertained. I've also found that sitting on the pews helps keep him more contained also, so that was helpful. 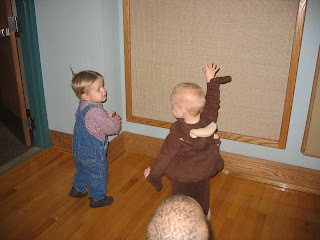 I guess the countdown to nursery is on -- only 4 more weeks! 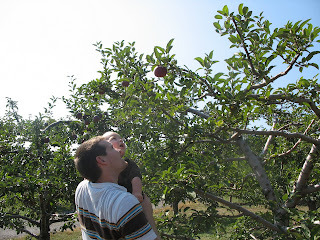 We went apple picking on Columbus Day, and I have to laugh because it seems like everyone else that I know did too! 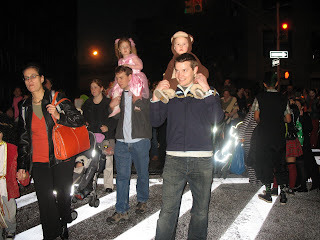 It just seemed like the perfect thing to do at the end of an October 3-day weekend in NY. Jon likes to make fun of this East Coast tradition saying that "in Oregon, this isn't something we do for fun... my parents would always drag us there and use us as manual labor!" 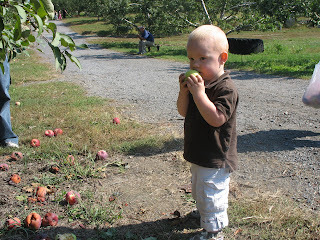 But for me, apple picking is something I always look forward to doing every year. 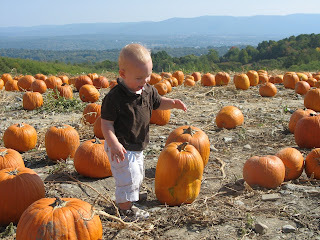 We went up to Lawrence Farms in Newburgh, where I grew up. I lovelovelove the scenery there and it's always a nostalgic place for me to visit in the fall. The trees are always beautiful as the season changes and the view of the Hudson Valley is amazing from the pumpkin patch. 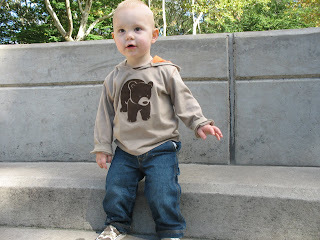 It was so much fun to bring Noah there this year. 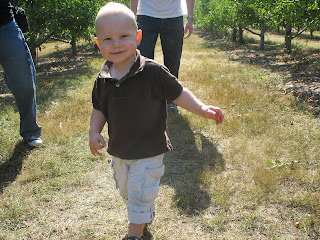 He had a blast running through the apple orchards, seeing the animals, and playing in the children's village. We picked a pumpkin and some yummy apples -- the red delicious were to die for -- and had fun hanging out with gma S. and uncle caulin. Ugh! I know city life has it's perks and it's drawbacks, but this is just one of those things that makes me want to pack it up and move on out! We were definitely sheltered from these types of pest-problems when we first moved to NYC -- because we lived in student housing for 4 years. We were on the 22nd floor of a high rise building and it was highly unlikely that the roaches and rodents were going to make it up that high to pester us. But last year when we moved down the street to a 6-story building, away from the cozy student housing life, we got a taste of real NYC (read: real Washington Heights) living. We've dealt with the roaches, the noisy neighbors, and even the inconvenient laundry facilities as well as to be expected. But as soon as I noticed that our loaf of bread had been chewed through by something other than my 17-month old son, I pretty much lost it (we're talking a feet-stamping, leg-kicking, fist-punching toddler-like tantrum by yours truly). I've still yet to catch one of the little suckers and the exterminator for our building can't come until next week! does anyone have any rodent-removal tips? So, Noah has been obsessed with his stroller lately. When it's sitting in the hallway, he will try to climb in it and buckle the straps or he will get behind it and try to push it down the hallway. 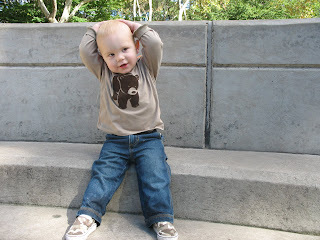 And when we're out at the park he even will try to swipe other kids' strollers and do the same thing. This will usually end up with him pulling the stroller over on top of himself or him getting in trouble for touching other people's things. So, I decided that it might be a good idea to find a doll stroller for him to push around. My husband was dead-set against the idea saying it was too "girly", but I just told him that it was really training him to be a good father. Afterall, he pushes a stroller around! So, I started my search for a doll stroller and after going to a zillion toy stores in manhattan, all I could find were hot pink strollers. I was actually tempted to just buy one, but I thought that might push Jon over the edge. I'll be honest, I was seriously disappointed with the toy industry and their gender-specific toy choices! So, after my exhausted efforts I decided to just look online. I found a cute little navy blue stroller on Amazon and ordered it right away. I should've just done that in the first place becuase I ended up spending more money on train fare than I did on shipping! 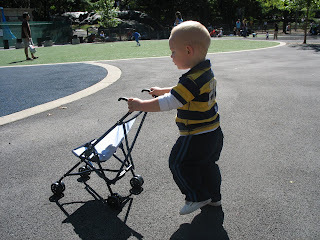 Anyway, we got the stroller this weekend and took it out for its debut stroll in Central Park. Noah was loving it -- probably not as much as I was, though! He looked SO cute.